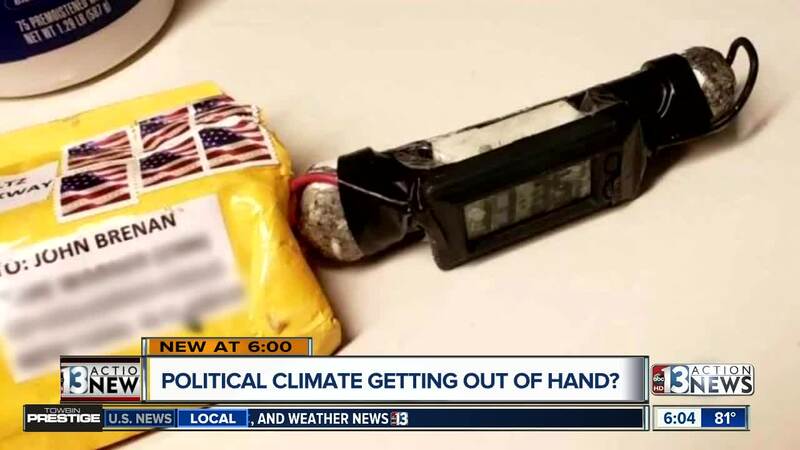 The suspected mail bomber Cesar Sayoc had a history of anti-media and anti-Democratic social media posts, according to national law enforcement. Sayoc's turn to potential violence had many concerned whether the current political climate is fanning the flames. President Trump has downplayed his sometimes fiery rhetoric's role in the case. However, at an event Thursday, Nevada Democratic Party Chair William McCurdy disagreed, saying to the crowd gathered at the Bernie Sanders rally "I shouldn't feel like our president had something to do with that. His word, his hate is hurting our country." The current political tone has two long-time investigators concerned about the potential for violence. It wouldn't be the first time we've seen political rage right here in the valley. In 2016, a British man was arrested at the Treasure Island hotel-casino in a plot to assassinate then-candidate Donald Trump. And in 2014, while Hillary Clinton was speaking at a recycling convention at Mandalay Bay, a woman was arrested after sneaking a shoe in her purse and hurling it at Clinton. Also, just a few months ago, a Henderson man armed with a rifle was arrested after holding up traffic at the Hoover Dam with an armored car. He was holding up political signs related to the Clinton e-mails. Experts say in many cases, law enforcement's hands are tied in these kinds of situations until someone's political views turn into something worse. "Being unstable does not mean law enforcement can play a role until there is an action," retired LVMPD Lt. Randy Sutton said. Experts warn politics can also cause people to rationalize violence. "When they look at somebody like a political figure making a stupid comment about hurting people or the news media they're unhinged and they use that motivation to do what they do because they're doing what they think that person wants them to do," longtime investigator and security expert Doug Poppa said.